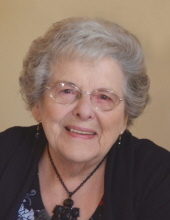 MARJORIE “MARGE” SELLERS, 95, of Morrison, IL, formerly of Savanna, IL, died Wednesday February 6, 2019 at her home. Cremation rites have been accorded. A memorial mass will be held at 10:00 A.M. Wednesday, February 13, 2019 at St. Mary’s Catholic Church in Morrison, with Rev. Father John Stack officiating. There will be no visitation. Interment will be at a later date at St. John the Baptist Catholic Cemetery in Savanna. The Morrison Chapel of the Bosma-Renkes Funeral Home assisted the family with arrangements. Memorials to St. Mary’s Catholic Church and the Fabry Support Information Group (FSIG) have been established. Marge was born May 13, 1923, in Winner, SD, to Frank and Angie (Halfman) Lineback. She was educated in the rural Carroll County IL schools. On April 22, 1946 she married Bernard Sellers in Savanna. He died in 1982. She had been employed at the Peterson Drug Store Fountain in Morrison. She was an active member and volunteer at St. Mary’s Catholic Church in Morrison. Marge enjoyed playing Bridge and belonged to several Bridge clubs. She was preceded in death by her husband, Bernard; one sister, Leona Brock; two brothers, Paul and Bob Linebeck. To send flowers or a remembrance gift to the family of Marjorie "Marge" Sellers, please visit our Tribute Store. "Email Address" would like to share the life celebration of Marjorie "Marge" Sellers. Click on the "link" to go to share a favorite memory or leave a condolence message for the family.